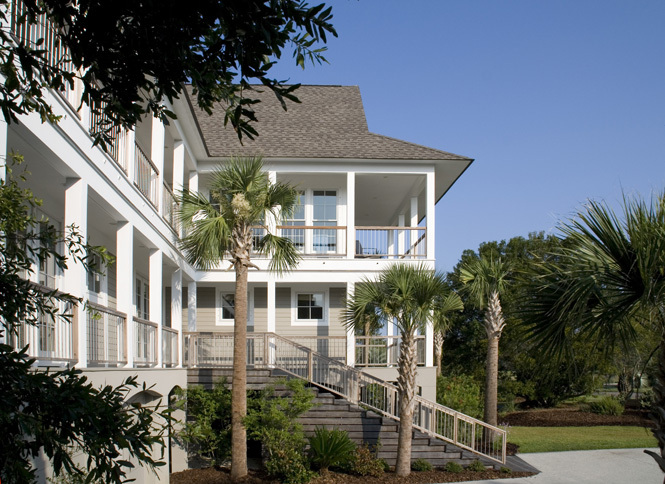 Located in a resort community near Charleston, South Carolina, this three-bedroom weekend home is designed to provide an Atlanta family a seaside getaway from the frantic pace of the southeast’s largest metropolis. Although the property is relatively small and is in close proximity to its neighbors, the location offers unobstructed views of natural marshlands to the front and the Atlantic Ocean to the rear. To optimize these spectacular views the owners requested that the living spaces (living room, dining room, kitchen and outdoor entertainment areas) be located on the top floor. Three bedrooms and bathrooms would be located on the main floor or entry level, which is elevated to nine feet above existing finish grade to accommodate storm surge flooding. A garage and storage areas would occupy the ground floor level. In addition to the site amenities and the owners’ program, the design had to address the aesthetic requirements of the resort’s design review board, where an emphasis is placed on historical and traditional precedents. The plan solution is a T-shaped arrangement of the major programmatic requirements. The top of the ‘T’ runs from front to back and the leg runs across the site. As a result, each room has at least one major view to the marsh or ocean, and several spaces have both views. On the main level, the secondary bedrooms are located at the opposite ends of the top of the T and the master bedroom is located at the end of the leg. Space between the secondary bedrooms at the top of the ‘T’ forms the core of the house and contains mechanical space, elevator, stair and utility space. The entry hall is located at the juncture between the top and the leg of the ‘T’. On the top floor, the living room and dining room/kitchen are located on the opposite ends of the top of the ‘T’ and the study/den is located at the end of the leg. The core of the house continues to the second floor at the top of the ‘T’, and a large out-door entertainment room connects the study to the living spaces and core. 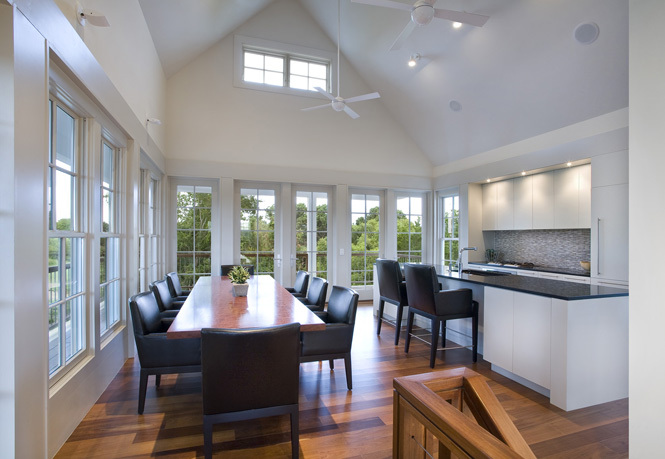 This arrangement of indoor and outdoor rooms creates an open and flowing entertainment space that incorporates the best aspects of the site: marsh views, ocean views, ocean breezes and abundant natural light. To provide ample outdoor space, sun shading and access to the large quantities of windows, the design incorporates a nearly continuous band of wrap-around decks. The exterior porches and their corresponding column supports are designed to reflect the tradition of low-country homes. The roof forms are also reminiscent of a low-country or French colonial aesthetic commonly found in this part of South Carolina and the costal areas of southeast Georgia. Simple gabled forms with hipped porch coverings provide ample shading and weather protection for the outdoor entertainment spaces.